Students around the world raised their voices Friday to call for stronger policies and practices to combat climate change. Thousands of young people turned out for the climate strike, many of them skipping school to march, chant, and demonstrate. Events were scheduled in 123 countries, according to Fridays for Future, which helped organize the demonstrations. 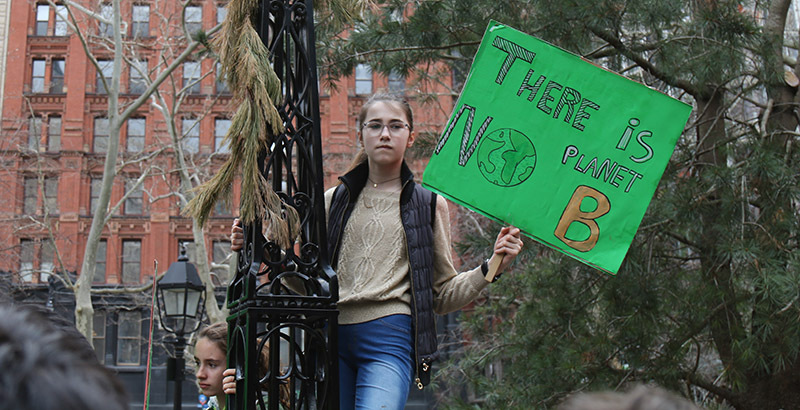 The protests were part of a growing movement started by Greta Thunberg, a 16-year-old from Sweden who has received international attention for her climate activism. She started with a solo strike in August in front of the Swedish Parliament in Stockholm. Since then, she has spoken at the World Economic Forum in Davos, Switzerland, and at United Nations climate talks in Katowice, Poland — and has even been nominated for the Nobel Peace Prize. Thunberg’s movement initially gained traction in Europe, but protests were held on every continent Friday — even Antarctica. In the U.S., marches were held in more than 200 locations, from San Francisco to Salt Lake City to New York. Thunberg and six other student activists wrote an opinion article published Friday in The Guardian explaining the strike.